Politicians on both the Left and the Right have increasingly embraced subsidies for hydrogenpowered fuel cells as a promising way to move America away from reliance on petroleum. Although advocates concede that such technologies are at least several decades away from penetrating the market in any significant manner because of cost considerations, less attention has been paid to the environmental implications of such a transition. Given current technology, switching from gasoline to hydrogen-powered fuel cells would greatly increase energy consumption even if the hydrogen were extracted from water rather than from fossil fuels. That's because it takes a tremendous amount of electricity to harvest hydrogen and to deliver it to consumers. Moreover, a transition from gasoline to hydrogen would nearly double net greenhouse gas emissions attributable to passenger vehicles, given the current fuel mix in the electricity sector. 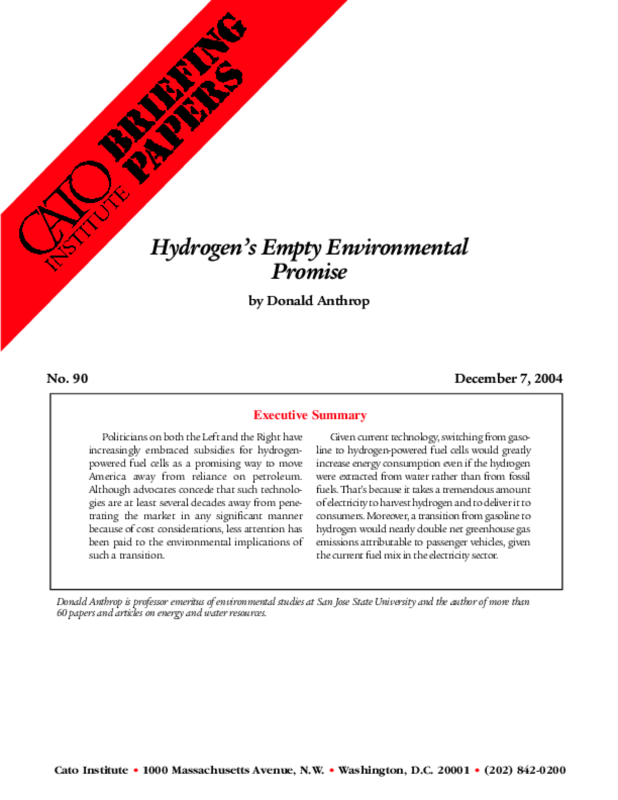 Copyright 2004 The Cato Institute. All rights reserved.